We wish to kindly invite you to take part in the International conference "Structural and functional deviations from normal growth and development of plants under the influence of environmental factors" on 20-24 June, 2011 to be held in Petrozavodsk (Russia). Scientific School of Young Scientists "Biology of development abnormalities in plants" will be organized in frames of the Conference. The United Nations General Assembly has declared 2011 as the International Year of Forests. 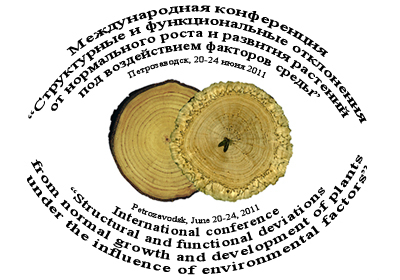 In this regard, significant attention at the Conference will be given to growth and development of woody plants, including cambial growth abnormalities of deciduous and coniferous tree species. During the ontogeny a deviations from normal growth and development of plant can be rather essential. Recent advances in molecular biology allow to give a new look at the problem of effect of changed parental phenotype on offsprings phenotype. This problem will be one of the questions for discussion on the Scientific School. 1) Biochemical, functional, anatomo-morphological and habitus deviations from normal growth and development of plants in reply to influence of environmental factors. 2) Molecular biology, biochemical and physiological mechanisms of induction of structural abnormalities. 3) The problem of modifications inheritance. Genetic, physiological, morphological aspects of ecological aftereffects. We look forward to meet you in Petrozavodsk. Please, complete Registration Form (DOC) and email it to fri2011@krc.karelia.ru together with your abstract (up to 1000 symbols). The deadline for registration is February 28, 2011. First Announcement - December 22, 2010. Preliminary Registration Deadline - February 28, 2011. Paper Submission Deadline - March 30, 2011. Second Announcement - April 30, 2011. Conference Dates. Payment of Registration Fee - June 20-24, 2011. Dear Colleagues! Please pay attention, that in Petrozavodsk the exchange of money is possible only from EUR and USD on RUB. It will be impossible to exchange other currencies! Please pay attention that dates of the Conference are coincide with celebrating the City Day (June 20-27). We remind you to reserve your accommodation early (up to February). You will have to make you own arrangements for accommodations. Most of these accommodations are within walking distance of the Conference Venue – Karelian Research Center. For details, please check the hotel`s web site. Conference participants will have the opportunity to see the sights of Petrozavodsk and Karelia. During the Conference prof. Carmen Marсati (UNESP, Botucatu, Brazil), Member of IAWA Council will organize the IAWA Session. Please note, that in Petrozavodsk the exchange of money is possible only from EUR and USD on RUB. It will be impossible to exchange other currencies! Dear Colleagues! Conference Proceedings (PDF) are available for download.